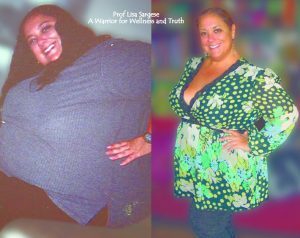 Professor Lisa Sargese is a warrior for wellness, recovery, and truth. Even though as a teenager she survived a bad car accident that left her on crutches for 3 years, suffered major depression, is in recovery from a severe eating disorder that began at age 5, survived major complications from 3 weight loss surgeries (including the lap band and gastric bypass), toughed it out in a wheelchair for years, had 2 total knee replacements, is making sense of her childhood as the daughter of a mother with NPD, and is forming a positive body image in spite of society’s unkind beauty standards, she remains hopeful, faithful, and positive about her and your ability to heal for real! Prof Lisa has been teaching college courses on religion, women’s studies, and psychology for over fifteen years. She holds two master’s degrees, one in theology from Drew University and one in counseling and human services from Montclair State University. She gives talks around the tri-state area on mindfulness, stress relief, addiction recovery, and healing practices of the world religions. Dedicated to helping people live healthier, happier lives, she is a certified hypnotist-counselor and trained Qigong therapist. Prof Lisa speaks, vlogs on YouTube, and posts daily on social media on goal-reaching, recovery, the mind-body connection, spirituality, and healing. In 2009, she received the Mirror Mirror Award for her work in body image and eating disorder recovery. In 2012 she was honored with the Tikkun Olam Award for her interfaith work. I had my first weight loss surgery at age 23 in 1988 as part of Dr. Lubomyr Kuzmak’s trial group for the first adjustable gastric band in the USA (not called the lap band as it was done via open incision). When it sprang a leak, I received another gastric band via open surgery in 1993. After the port flipped over inside me, I decided to just live with it rather than have another surgery. The band, now empty of all its saline, let most foods pass into my stomach. This ended my use of weight loss surgery as a tool. The scale reached its highest (400+ pounds) in 2006. Meanwhile the old gastric band dug into my stomach causing scar tissue and adesions that frightened off most of the surgeons I went to asking them to remove it. I finally had a revision from the band to an RNY gastric bypass in 2006 by a highly skilled surgeon. I was in ICU for days, but I lived! Riding the post-op honeymoon high of rapid weight loss and cases of energy drinks to fuel my obsessive workouts, I lost over 120 pounds in less than a year. The next year I lost only 20 pounds. Then I hit a plateau and my energy bottomed out. I was too fatigued to do much of anything except teach and blog. I couldn’t even stand in the shower. I regained half the weight, even though I was consuming a small amount of food. My body began to break down from exhaustion and lack of nourishment. My hair fell out in handfuls and my face looked grey (the WLS world calls it ‘grey ghost syndrome’). As I broke down, my osteo arthritis destroyed my knees. I spent 2 years in a wheelchair as I fought for and healed from surgeries. Then I had two total knee replacements. Along with hard work in physical therapy, I was able to walk again. During this time, I blogged every day for almost 10 years. I recorded every breakdown and win, every new diet, the sadness of regain, and the hope of new ways to heal. I am now in the process of making these blog posts into books. You can now share in my life lessons year by year since the gastric bypass. Read about the brick walls that I hit, so many do. Read about how I hit a plateau, regained some weight, and panicked! I was halfway to skinny and fell apart. After years of mental struggle, I’m here in the present, renewed from the inside out, and am losing the rest of the weight. How am I back on the losing streak? I’m using my own unique method. I thought food addiction was my problem. Turns out it was something else. Through my social media, books, CDs, and YouTube videos, I share in my life lessons as I recover from depression, sleep apnea, type 2 diabetes, arthritis, anemia, adrenal fatigue, crippling body shame, and a severe binge eating disorder. I’ve learned the hard way that “eating less and exercising more” is not a guarantee of thinness. Thinness is not equal to health. Losing weight doesn’t guarantee happiness. Healing has to happen in the spirit and the mind before the body can safely respond. I’m learning how to be gentle on myself, to practice self acceptance, to listen to what my body needs, and change my thought habits to create a life I love. I want to share my life lessons with you! We’re more than surviving. We’re healing. Let’s heal for real, together! Read my book on Kindle, Audible, or paperback for an amazing story of recovery! 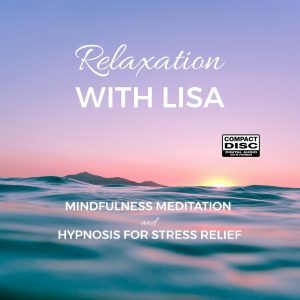 De-Stress with Lisa’s Relaxation Meditation CD!